In this post, we will review 5 more ways we can help make this world a better place more effectively. Earning to give is the deliberate pursuit of a high paying career for the purpose of donating a significant portion of earned income. As we’ve said earlier, financial independence does not necessarily mean stopping to work. In some cases, continuing to work may be the best way one can do good. After having achieved FI, we’re in a position to donate a greater amount to charity. And if donated effectively, this can potentially have a much higher impact than if we had decided to work directly at a non-profit. In some cases, the donation from people who earn to give can fund the salaries of multiple other more qualified people to work at those charities. A great option for those of us who enjoy their work, don’t see themselves changing to a high impact career or start a new project right away. The most famous examples of the earn to give approach to philanthropy are probably Bill Gates and Warren Buffet. Together and via the work of the Bill and Melinda Gates Foundation, they have saved and improved the lives of millions of people globally. This is clearly something they could not have done if they had decided to work directly as aid workers. As explained by 80,000Hours.org, people in the tech and finance industries can in some cases earn enough to live a very comfortable life and save the the lives of several people every year. Some members of the effective altruism movement deliberately pick their career so that they can donate more. Earning to give can also be a temporary option, one where you develop skill and career capital, while contributing to causes that are funding constrained. This is indeed not for everyone. If you’re considering this route, 80,000 hours provide great guidance on whether this could be a good option for you. 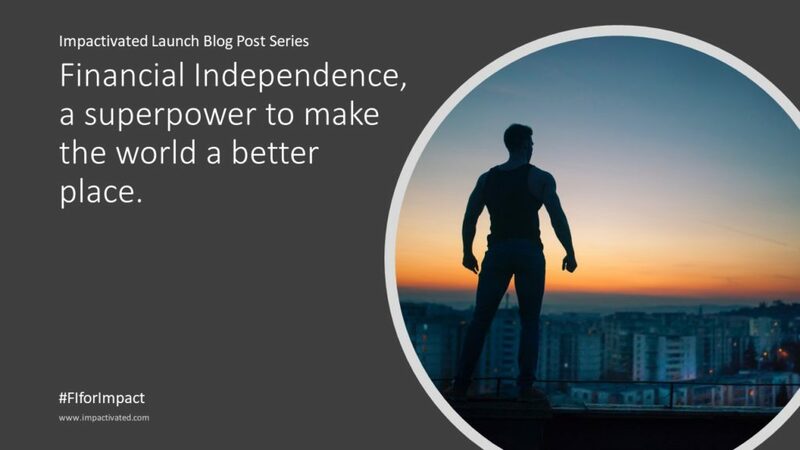 With financial independence, earning to give can be even more powerful. We can for example decide to donate the majority or even all of our earnings, or even better, we can combine earn to give with a high impact career, effectively doing good twice! FI can truly be a superpower to make the world better! For the more entrepreneurial among us, there is also the start-up path! With financial independence, we basically free yourself from one of the major downsides of entrepreneurship: the fact that we depend on our idea to be a commercial success rapidly. Instead, we can take more risk, we can take longer to tune the idea, we can allow ourselves to be more creative and we can challenge the status quo with more confidence. A high impact charity would be one that contributes to a high priority cause (and in particular ending global poverty through international aid), and that implements evidence-backed, cost-effective programs, with a high level of transparency and monitoring, so as to meet the criteria of organizations such as Givewell. There are a number of evidence-based interventions and ideas (and one more here) for which there is available funding (from organizations such as GiveWell, CIFF and the Gates Foundation) but for which there is not yet well-run transparent organizations implementing them. Given that we are in a position where we can take more risks, this is potentially one of the most impactful routes people in the FI community could take. Especially for those of us with experience in entrepreneurship, consulting, project management and program implementation. Wouldn’t it be amazing if we could create a high impact charity, powered by the contributions of the FI community? If this path interests you, the effective altruism community has also some great resources and guidance to help you start an EA-inspired project or high impact charity. For more information, I recommend reading this blog post and the 80,000 hours career path review. The methods used by effective altruism to select and solve problems have been applied to many promising areas, But there is no doubt that this approach can help increase the impact of many more types of activities. Using evidence and careful reasoning can be applied to many other projects and programs where the stated aim is to do good. Using the the EA impact assessment comparison tool or this prioritization tool to select activities or find ways to improve an existing project can be very powerful. “Doing good” is the stated goal of many projects and organizations, yet very few actually achieve the level of impact or effectiveness of the organizations associated with effective altruism. Many communities would benefit from applying the EA method to selecting problems and finding solutions. Corporate social responsibility or sustainability programs are one example. Social entrepreneurship is another one. Of course these models have their own set of constraints, but they would greatly benefit if they were to make impact part of their metrics. Applying the EA mindset can also be done in your community. Here is an example of a doctor who realized how much good he could do with effective giving and he started raising awareness about it among his peers. The fact that I am writing this series of blog post is another example of how we can bring the EA mindset to our communities. I am hoping it will inspire many of us to adopt some of the thinking and activities of the effective altruism movement. The same could be done at your workplace! If you would like to bring the EA mindset to your work, the center for effective altruism can provide support. Another way of having a positive impact is by helping more people have a positive impact. This could be an excellent option if you’re unsure which other more active path you could take. It’s a great way to learn more about effective altruism, to connect with like-minded people and expand your understanding of the issues and where you could play a role. 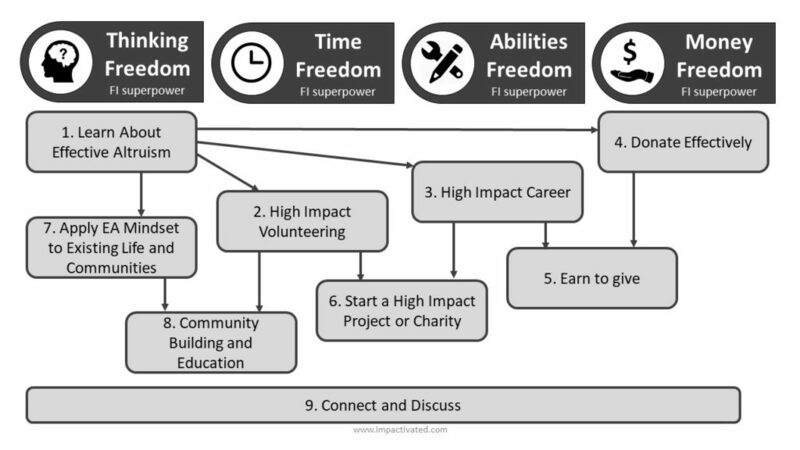 This is what I am doing via this series of blog posts: I am aiming to increase the awareness about how the FI superpower can help us do a lot of good and I am hoping the meet people with whom this resonates. If my efforts lead me to reach to an extra 5 or 10 people who will embrace effective altruism, then that might be worth as much as what I could accomplish in my lifetime, dependending on the level of commitment. If you’re in the FI community and are interested in helping me spread the word about effective altruism, please get in touch! There are many ways we can raise awareness and help people find ways they can do good better. If you’re a student or a professor, teaching a course on effective altruism could be a great way to raise awareness. You can also start an effective altruism group in your community and run events or workshops. Whether you decide to commit or not to the suggested paths described in this article, connecting and discussing these ideas is a great way to learn more about them and help others refine their thinking. By discussing projects and ideas online on the EA forum or Facebook group. And if you’re interested in discussing how we can combine our FI superpower with high impact, please join the #FIforImpact movement! Next Post #FIforImpact: Let’s go do good together!